Fibromyalgia is a form of rheumatism that does not affect the joints, but rather the muscles and connective tissue. The name of this condition comes from the Greek ‘fibro’, which means ‘fibrous tissue’, ‘myo’, which can be translated as ‘muscle’, and ‘algos’, meaning pain. Some refer to this condition as ‘soft-tissue rheumatism’ or ‘muscular rheumatism’. Fibromyalgia affects 2% of all adults aged 20 to 60, and women are ten times more likely to suffer from this condition than men. The common characteristics of this condition are chronic pain and stiffness of the whole body. However, the most affected areas are the neck, hips, shoulders, and hands. The pain radiates to the muscles of the whole body. Patients also suffer from gastro-intestinal symptoms, skin conditions such as eczema, dry eyes and a dry mouth. Fibromyalgia also causes a tingling or burning sensation in the limbs. The symptoms tend to be worse in the morning. Many patients also suffer sleep disorders, with the lack of sleep making them overtired. This, in turn, can lead to chronic energy loss and exhaustion. Scientists have not yet identified the exact causes of fibromyalgia. Patients generally look healthy, they have normal blood levels and research has shown they have no anomalies in the muscles or connective tissue. Since there is no visible cause, it is virtually impossible to diagnose the disease, which makes it extremely difficult for physicians to find out whether patients suffer from fibromyalgia. In fact, it was only in 1976 that scientists classified this condition as a distinct disease. That allowed physicians to draw up a protocol to diagnose fibromyalgia. Meanwhile, researchers have been trying to pinpoint the causes of the disease for forty years, but the condition is so complex that it is not clear what exactly they should be looking for. Consequently, research programs have a very broad scope, focusing mainly on the differences between healthy persons and fibromyalgia sufferers. Naturally, four decades of research into this condition have yielded some results. 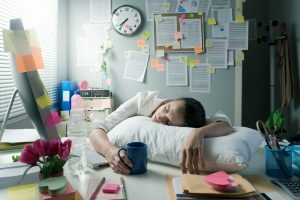 It turns out that the main difference between healthy individuals and persons suffering from fibromyalgia is that the latter are incapable of achieving deep sleep. 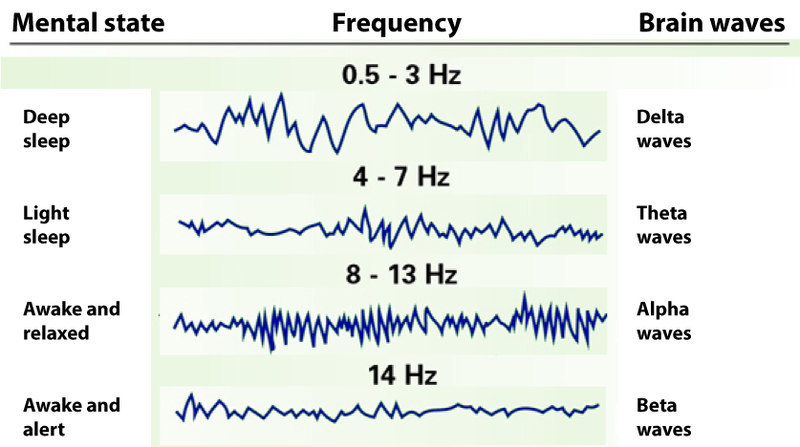 This is because alpha waves disrupt the delta waves, which are responsible for this sleep state. 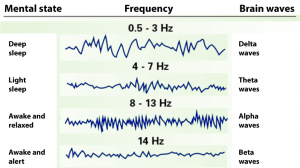 Alpha waves are actually responsible for keeping us awake. Fibromyalgia patients therefore suffer from a chronic lack of sleep. As a result, their bodies do not produce enough growth hormones to repair and maintain muscle and connective tissue. This could be a cause for the pain and stiffness patients’ experience. Moreover, research shows that abnormalities in the neurotransmitters such as the endorphins, serotonin and dopamine, cause the chronic lack of sleep. The brain produces these substances, which tell the body what to do. In fibromyalgia patients, the production of these neurotransmitters follows an abnormal course, which leads not only to sleep disorders, but also changes the way the body manages pain. Scientific research also shows that the cause of fibromyalgia may lie in a malfunctioning nervous system. Scientists do not think the immune system plays a role in this disorder. However, further research is required to determine the exact causes of fibromyalgia based on these findings. The chronic pain and/or stiffness needs to affect three or more body parts for at least three months, both above and below the waist, and both left and right. 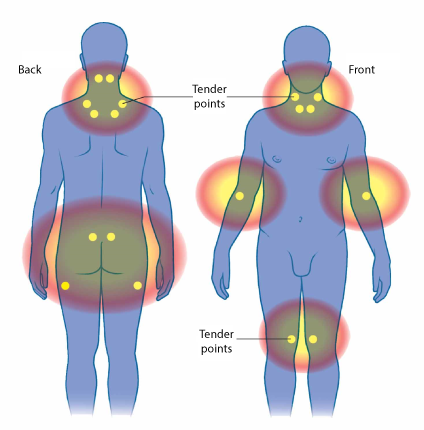 Pain points (‘tender points’) need to affect a minimum of 11 out of 18 specific body areas. These are the 18 ‘tender points’ for fibromyalgia. This procedure to diagnose fibromyalgia is not always objective. Therefore, many people, even in medical circles, tend not to take this disease seriously. Consequently, a set of new criteria for the diagnosis of fibromyalgia was developed in 2010, the so-called ‘fibromyalgia score’, which consists of a ‘widespread pain index’ and a ‘symptom severity score’ that need to be added up. A doctor will diagnose a patient with Fibromyalgia if the patient has a combined score of 12 or more, the widespread pain index 3 or more, and the symptom severity score 5 or more. Nowadays, when using these criteria, the ‘tender points’ are no longer taken into account for the diagnosis of the disease. The physician will determine in which of 19 specific body areas the patient felt pain during the past week (1 point for each body area that hurt). Consequently, if someone experienced pain in four body areas, his pain score will be 4. The physician will take into consideration the following 19 body parts for this score: chest, stomach, upper back, lower back, neck, left shoulder girdle, right shoulder girdle, upper arm, forearm, hip area (buttocks, trochanter), femur, lower leg, and jaw. The lowest possible pain score is 0 and the highest is 19 (we noticed that the body areas listed are not 19 but 13, but we have not changed this because all our sources mention this figure). The following somatic symptoms are taken into account: muscle pain, irritable bowel syndrome, fatigue, cognitive symptoms (difficulty thinking and concentrating), muscle weakness, headache, abdominal pain and cramps, numbness/tingling, dizziness, insomnia, depression, constipation, epigastric pain, nausea, nervousness, chest pain, blurred vision, fever, diarrhoea, dry mouth, itchiness, wheezing, Raynaud’s disease, hives, tinnitus, vomiting, heartburn, mouth ulcers, lack of/altered taste, epileptic fits, dry eyes, shortness of breath, decreased appetite, rashes, allergy to sunlight, hearing problems, easy bruising, hair loss, frequent urination, painful urination and bladder cramps. The symptom severity score is the sum of the severity of the three symptoms listed above (fatigue, waking unrefreshed, and difficulty thinking and concentrating) plus the number of additional symptoms. As such, the symptom severity score ranges from 0 to 12. The fibromyalgia score is calculated by adding up the widespread pain index and the symptom severity score. It ranges from 0 (no fibromyalgia symptoms) to 31 (severe fibromyalgia). How does one treat fibromyalgia? As mentioned earlier, little is known about the actual causes of fibromyalgia. Consequently, to date there is no treatment method for this condition. Physicians can therefore focus solely on easing the main symptoms, namely pain, fatigue, sleep disorders and stiffness. Your doctor may prescribe a painkiller like acetaminophen for pain relief; some others are amitriptyline, duloxetine, pregabalin, or gabapentin. 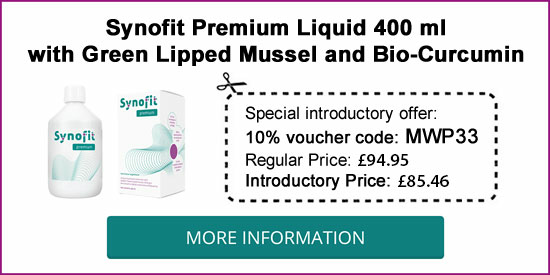 In some cases, a natural alternative also proves successful, namely the liquid combination of Green-lipped mussel and Curcumin. Fibromyalgia per se may not cause inflammation, but some patients report feeling better using natural anti-inflammatories. If you start taking such a natural alternative and fail to see results within 80 days, it is advisable to stop the treatment. If, however, it does prove useful, you can continue taking this liquid combination of Green-lipped mussel and Curcumin, which you can buy at pharmacies, health shops, and online without prescription. A physical therapist can also help you boost your physical condition and endurance. Moreover, you can start swimming, cycling or walking to keep your muscles strong and flexible, but if you decide to do so, ask your physician for advice first. Last, but not least, a nutritionist can help you improve your eating habits to boost your energy levels and fight fatigue. Take a ‘power nap’ of maximum 20 minutes during the day. This should boost your energy levels. Make sure you do not sleep longer than 20 minutes, though, because if you do, you will have trouble falling asleep at night. Some people report an extra boost if they have a cup of coffee before their power nap. Create a routine. Go to bed and wake up at the same time every day. Make sure you get sufficient exercise. You will not sleep well if you have been sitting the whole day. Do not drink any stimulating drinks before going to sleep in the evening. This includes coffee, tea, soft drinks and alcohol. Relax before you head to bed. Read a book, watch a romantic film or do some relaxation exercises. 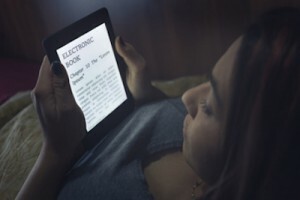 Try to avoid sitting in front of a screen half an hour before going to bed (that means no TV, computer, phone and tablet). The light of screens affects some people’s circadian rhythm, so using these devices can keep you from falling asleep. When in bed, concentrate on your breathing, which will calm you down and make it easier for you to fall asleep. Tip: watch this video in which a physician explains why a good night’s sleep is so important for fibromyalgia sufferers.